On Monday of this week, the hockey world noted the 54th anniversary of Gordie Howe scoring his 500th career goal. On March 14, 1962, Howe joined Maurice Richard as the only players in NHL history to have then reached this milestone. 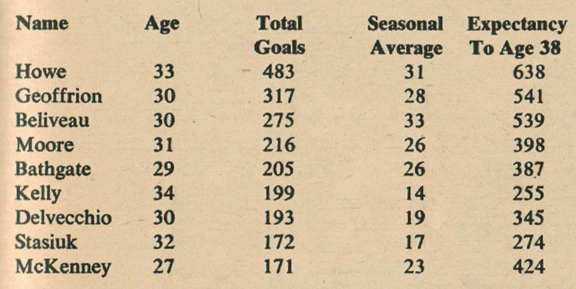 Richard had retired in 1960 with 544 career goals. A few weeks earlier, in the January 27, 1962, edition of the Canadian national Weekend Magazine, Andy O’Brien examined the NHL players of the day to determine who might surpass Richard’s record. While noting a couple that might come close, O’Brien believed only Gordie Howe had a chance. O’Brien did not look very far into the future; ignoring both Frank Mahovlich (who’d scored 48 goals in 1960-61 and would end the 1961-62 season with 142 for his career en route to a total of 533) and Bobby Hull (who was in the midst of a 50-goal season to bring his career total 151). 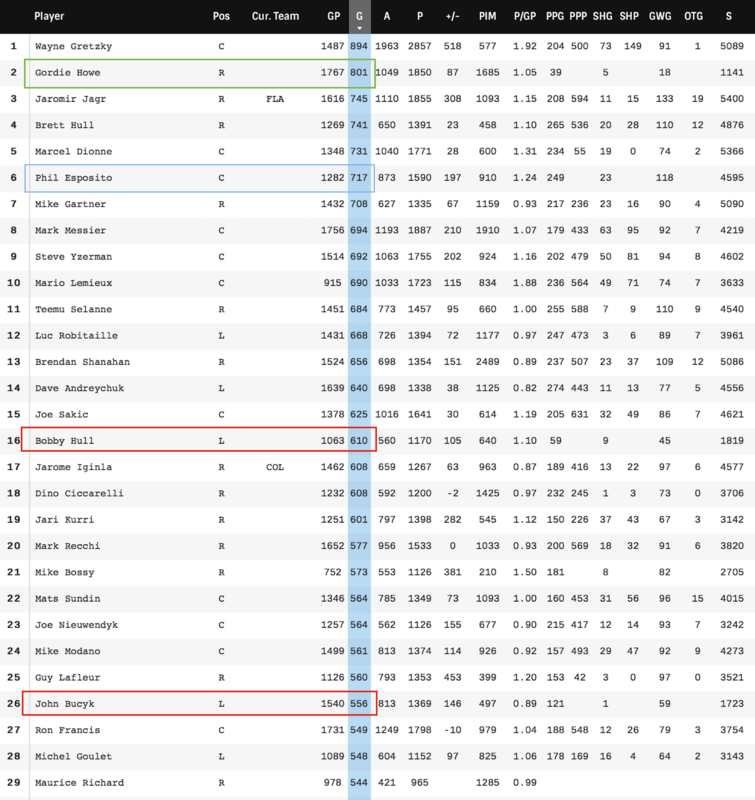 Only Howe (who had 649 goals through 1966-67 when he was 38), Red Kelly and Alex Delvecchio managed to exceed O’Briens’ projections, and of the 135 skaters active in the NHL during the 1961-62 season, he missed out on only Bobby Hull and John Bucyk (who had just 111 goals by the end of that year) as two who would also surpass Richard one day. Of all the others who’ve flown by the Rocket, only Phil Esposito began his career before NHL expansion – and even he was two years away from making his debut at the time of the article. I was doing a Sport magazine “Special” on Gordie and flew up to Montreal for the interview. He didn’t get the big one there. Then I flew to Boston for more. We became friends and my first book ever was “Gordie Howe” for Grosset and Dunlap. To this day I call him the best player I ever saw not counting goalies, of course. Great topic this week. Nice to see Stan’s comments. Gordie Howe is still THE champ in my mind! No one else played into their 50’s & his precision was amazing (yes I was actually watching all those years ago). Great blog as usual Eric! am glad you are on the mend. Happy Purim & Happy Spring!